Worldview Studio will be featuring a large selection of sculpture in both Bronze and Stone and is home to one of the largest collections of original Bronze Sculpture in the Ottawa Region, outside the National Gallery. Their sculpture, primarily figurative, expresses the intricate nature and complexities of human relationships. Dance and opera themes figure prominently in Janet’s works and you will find yourself half expecting her graceful bronzes to do a pirouette before your very eyes. 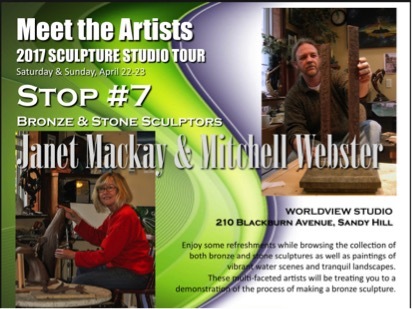 Mitchell will walk you through the creation of a bronze sculpture and answer all your questions about the process. They will also be showing their warm and inviting paintings of boats, canoes, kayaks, beautiful Canadian landscapes and the lakes and oceans we call home. Enjoy inviting Summer and Fall landscapes reminding us that Spring is just around the corner. © 2019 WorldView Studio All Rights Reserved.